The horror that the elk calf must have felt, dodging in and out of thick dog-hair stands of young lodgepole pines. Snow showering down upon her as she frantically runs through the small trees, looking for some sort of escape. None would present itself; they were right on her heels, there was nothing she could do. The only remains of the calf’s carcass were the hide, a front leg, and the frozen rumen contents of mulched grass. It had been picked clean, and there was not even a curious raven in the area. The previous day, I had spied an abnormally large amount eagles (golden and bald) and ravens in the young forest near Harlequin Lake; this was a sure sign of wolf activity indicating a recent kill. We had known the wolves were in the area that day. A collared wolf from the Cougar pack had testified to their presence. By that evening, the kill had been made. Booming signals from the collared wolf could be heard and scavenger activity was high. The next day, after assuring that the collared wolf had left the area (and thus indicating that the entire pack had left the area), we hiked in to the kill area (bear spray in hand just in case). 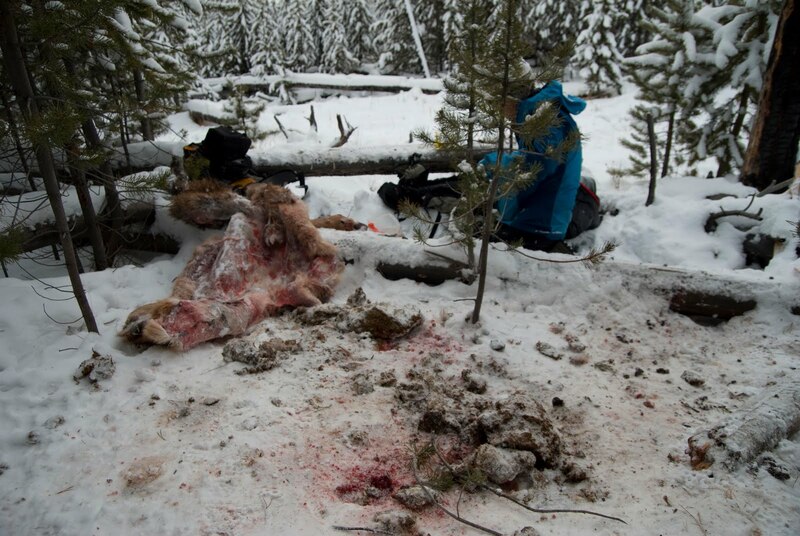 After an hour of tracking, following fresh wolf and coyote tracks, we ran into the kill site. The snow was tinted pink; hair masses and bone fragments were scattered through the trees. The hide had been drug uphill from the kill site, leaving a depressed path through the snow. This is just a small picture of the reality for wildlife in the Yellowstone ecosystem. A young calf is born only be fed to the wolves, coyotes, foxes, ravens, eagles, and many other organisms who would otherwise not survive to reproduce. It is interesting to imagine the nutrients from that single calf spread throughout many different species. And not only that, but the nutrients will be passed down through the generations of those and many more species, including plants (that will then be eaten by future elk calves). The interaction between elk and wolves is only a tiny subset of the dynamics in the Yellowstone ecosystem. And this tiny subset has taken twenty years of research to elucidate relationships between these two large mammals. And so, I am here in Yellowstone, continuing the research, tracking large canine predators through the park, seeking to understand their impact on the elk populations. The licked-clean hide of the calf lying in the pink snow vividly reveals the realities of these interactions.